Sometimes my kids are out the door before I have even finished the sentence, but sometimes they need a little coaxing. I’m a bit like that too. Sometimes I need a little push to get organised and outside. Outside play doesn’t have to be a struggle, a little pre-planning and some simple ideas will get everyone out into the fresh air without stress. Some days my kids are out the door first thing in the morning and are dragged back in, dirty and tired, when it gets too dark to see. To make days like those happen it needs to be easy to go outside and easy to stay outside. Have hats, shoes and sunscreen in a handy spot by the door so they are easy to find. Teach kids how to apply their own sunscreen. When they are little you will need to go over their sunscreen efforts, but I just supervise my big kids and remind them of spots the may have missed. Use a covering shirt or top like the ones my kids are wearing in these photos. They are from Three Sun Possums and are perfect for my super fair boys, keeping them cool and protected, while also cutting down on the amount of of sunscreen we need to apply. Find out more information below. Take lunch and snacks outside. A backyard picnic is always fun, and no crumbs to sweep off the floor either! Give kids a water bottle to keep outside so they don’t need to keep coming in and out to get a drink. Make a place outside for a rest and cool down after lots of wild and active play. A rug and some cushions in the shade is a perfect outdoor chill out spot. Go outside with them. 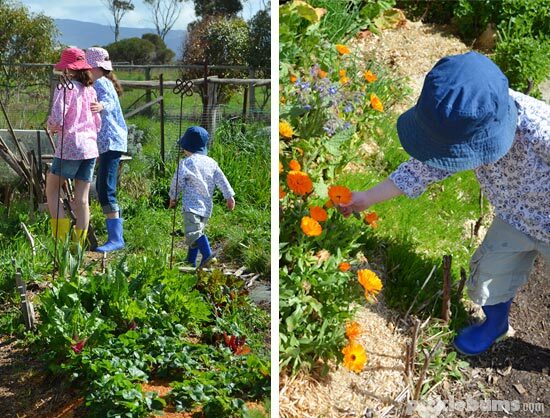 You don’t have to entertain your kids constantly, but if you are outside, gardening or reading or pottering around enjoying the back yard, your kids are much more likely to join in. Simple and Fun Outside Play Ideas. You don’t need to set up elaborate activities or full on sports matches to keep your kids engaged and happy outside. There are lots of simple activities and ideas that only need a little set up and even less clean up, and they are lots of fun. 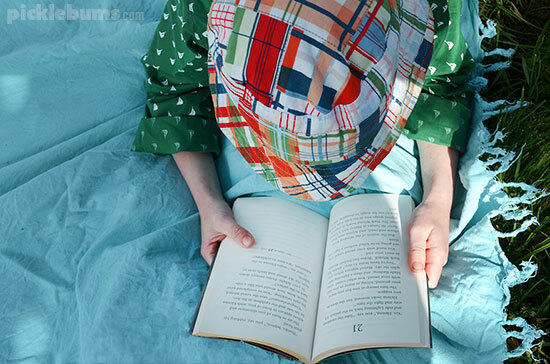 A pile of books or a construction set on a blanket in the shade is an easy quieter outside activity. 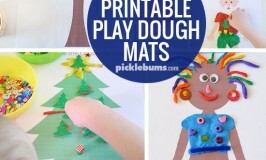 Set up play dough on an outside table and you won’t have to worry about the mess! Some plastic animals in the sand pit, a dirt patch, a garden bed or just in the grass is an easy invitation for imaginative play. Add some sticks, pebbles or other natural materials if you like. Bring some music outside, there is lots of space to dance and be loud! Some dolls or soft toys would love to have a tea party outside. 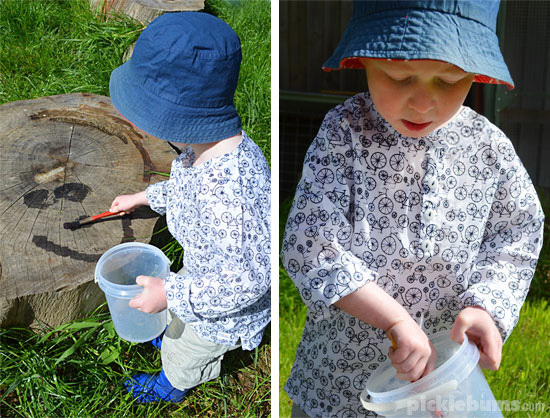 Try super simple, low mess, water play with a bucket and a brush to ‘paint’ things with water. You don’t need a fancy water table; try some of these DIY alternatives for water play. 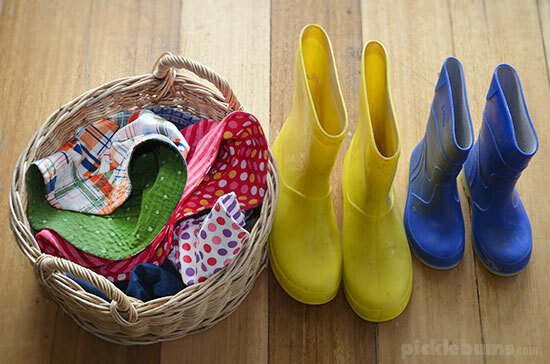 Add a bucket of water or a trickling hose to the sandpit, or a patch of dirt to make a mud patch! Freeze some treasures into ice blocks and watch them melt! Taking activities like slime or goop outside makes clean up much easier, you can just hose everyone and everything down! Keep it simple with a container or chalk for drawing. 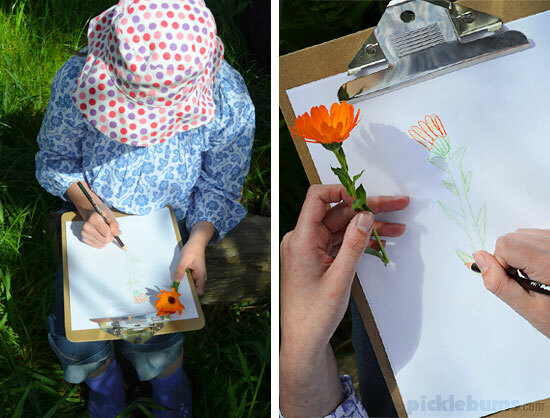 Use a clipboard to make your art portable and encourage your kids to find something outside to inspire their drawings. Go crazy painting or drawing on a big cardboard box to make a custom cubby house. Pick some flowers and make a daisy chain, or press them between the pages of a thick book. Plant a garden, there are lots of quick growing, kid-friendly plants and veggies. 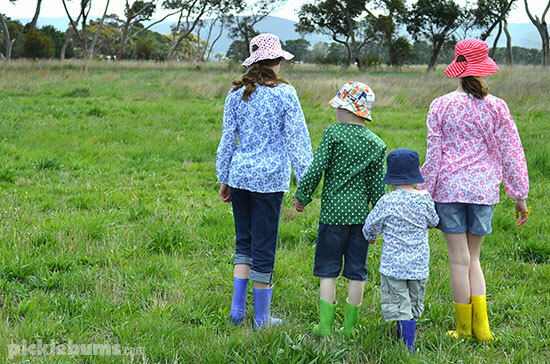 Make Going Outside Easy with Three Sun Possums Sun-savvy Playwear. I have two fair, and two super fair skinned, children so we are always looking for practical ways to keep them protected from the sun when they are outside. The Three Sun Possum shirts are light, comfortable, and cool, and because they have long sleeves and high necks it means we don’t have to use as much sunscreen. That is especially great for my little one, who suffers from eczema and sunscreen stings and makes it worse. The shirts come in a variety of lovely colours and patterns for boys and girls sizes 1-12 and ladies too. They are 100% cotton, lightweight and breathable so there are no hot, sweaty, grumpy kids. They are easy to wash, don’t require ironing (win! ), and my friend has already put her hand up for when my kids grow out of them and we hand them down. They are exactly what I’ve been looking for to help get us outside and enjoying the sunshine quickly, easily and comfortably. You can see the full range and buy online at the Three Sun Possum webite. Picklebums readers can also take advantage of a special introductory offer. If you buy two or more items from the Three Sun Possum range, use the coupon code ‘Picklebums’ to get 20% off the order total. Perfect for early Christmas shopping. Offer valid until October 31st 2014. What is your favourite outside activity? They look fab! I have fair skinned children as well and something lightweight like those shirts would be great to have for the warmer months and when we go travelling. Oh they’d be fab for travelling as they fold down to nothing!!! This is some really brilliant advice! When we head out, I always pack up my backpack full of everything we might need because I definitely think aside from getting out there in the first place, making it easy to stay outside is so vital. Especially take lots of food and water, always more than you think! Love the look of those tops, it can be tricky finding long sleeved tops that are light enough to be comfy for summer. This post could not have come at a better time for us. I’m always really conscious about the sun and look to purchase great products like this. Thank you. Will be sharing this on with my mothers group! I feel the same way Kate – I’ve been looking for similar shirts, especially for my boys for a while now and couldn’t find anything until it popped up in my inbox! My Noah’s eczema has been terrible all last term and I can’t figure out why! I wish I knew what his triggers were, so much easier to avoid than try and treat it. Have you found anything that works well? So glad to not have to add so much sunscreen to him this term as he is so incredibly fair skinned! My daughter has very fair skin, so checking out the tops! What a fabulous and fun looking range of shirts! This is great. My son and I are both fair skinned red heads and we live in a sub-tropical climate. Sometimes the two just don’t mix. Three Sun Possums looks like they offer some great products. I wonder if they ship international? These would be great Christmas gifts. We had a run of days last summer above 40, and even though I love the heat, that was a bit much even for me as the nights didn’t cool off which rarely happens here. I can’t imagine dealing with regular over 45 C temps!!!! Such simple ideas that we often forget! Thank you for reminding me that getting outside and being sun smart (with those beautiful tops) is a breeze! I think I’ll have to order some for my fair kids! Oh Michelle I am so impressed with your gorgeous range! I can not believe how light the shirts are!!! 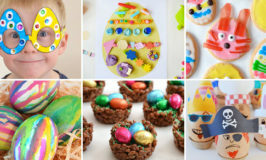 Such gorgeous patterns too – my kids love them and so do I! Great post Kate, love those shirts! It is hard to find something similar in the shops, it took me ages to find a few for my daughter and I couldn’t find anything like that for my sons – long sleeved, yet light weight. I love them because I agree the suncream can be a bit of a hassle and so many of them are dubious with regards to their ingredients – chemicals, artificial preservatives etc. I always think clothing protection trumps sun cream. Love outside play – it’s a win for everyone. My fave is setting myself up in my comfy banana chair and having the kids play around me – if I’m out there even if it’s just laying back and relaxing they will play and discover critters, insects, leaves, rocks etc for hours. It really is hard to find something like this for boys isn’t it! My boys are both super fair and I’ve been keeping my eye out for options like this for a long time and have never found anything as light and breathable. Thanks for the link to your eczema post I’m off to have a read. I was admiring the kids shirts too before I saw you mention them, what a great idea! My girls are quite sensitive to the products in sunscreens so this would be a perfect solution! Thanks for sharing! Also love your tip about making it easy to get outside…so true!!! Your lucky kids spend so much time outside since you are the outside play queen! These would be perfect… they also have dresses which I bet your girls would love! Awesome! Very easy to read and follow with sound advice. Would love to know, when taking indoor activities outside such as art, is this sufficient play? Are there enough health benefits compared to a run around? Would love to know your thoughts, thanks! I think it depends what your goals are… for me it is about getting outside, and enjoying outside play, not just about being active. 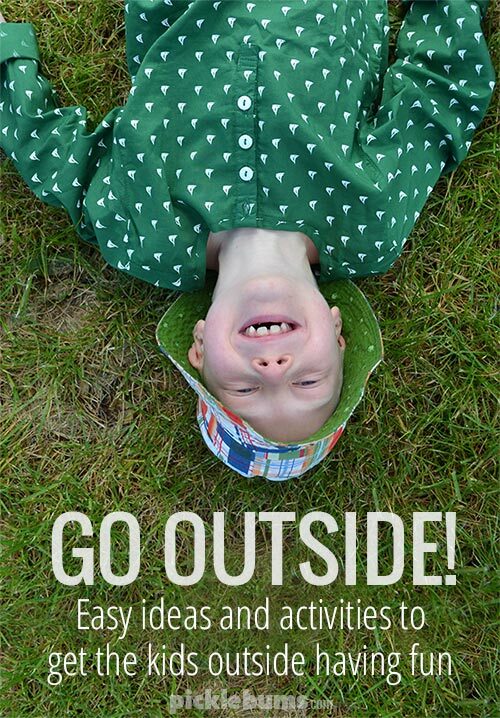 Encouraging kids to be more active outside is fab, but there are also lots of other benefits to being outside and simply playing – opportunities to engage with nature, fresh air and sunshine, space to do things differently to inside, space to make LOUD noise, space to make a mess, different challenges and opportunities and lots of new learning. With lots of opportunities for free play (both inside and outside) kids are naturally more active in a variety of ways. My six year old has eczema as well and we have the same issue with suncreen stinging etc Those shirts sound perfect and how adorable do they look? This is a really great option that I would never have thought of before. They are gorgeous… and lots of prints and colour combos that appealed to my 7 year old boy too, which is nice. What incredible products! I’m truly glad to have found them! Our favourite outdoor activity is simple water play and nature exploration. We do it so often and it’s always fun and engaging! Water is our favourite too! Plain old, water… cheap (free in our case as it comes from the rain!) and easy find and easy to clean up! The best! I’m a huge fan of anything outdoor related for kids and this post is gold. I’ve never heard of Three Sun Possums before, so thank you! I’m ALWAYS looking for ways to facilitate our love for the outdoors. Heading off to check out their products now. Great ideas, I love taking indoor activities outside, one of our favs :) The clothing range is cute, my daughter is so fair, we love anything that helps to protect her skin from the sun. Love those shirts!! I am always looking for alternatives and these are perfect. They are such cute shirts! I’m seriously thinking of ordering one for myself. Home » Go Outside! Easy ideas for outside play.